Don’t fear the grind, respect it. Don’t avoid the grind, embrace it. 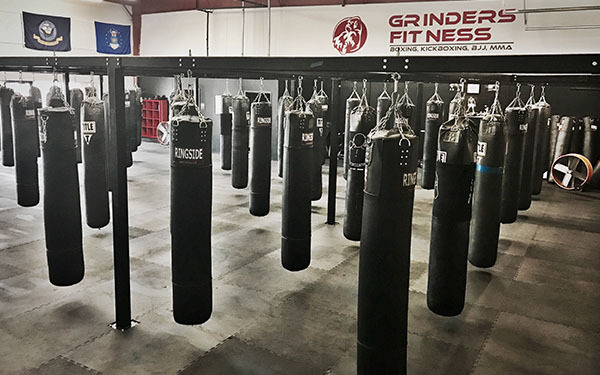 Grinders Fitness, a boxing, kickboxing, and MMA gym, in Northglenn Colorado opened on September 12th, 2016. Previously sisters Jessica Fiedler and Naomi Quinn had been members at Title Boxing Thornton. In July of 2016 it was announced that Title would be closing and Jessica and Naomi were worried about losing their favorite workout and trainers. 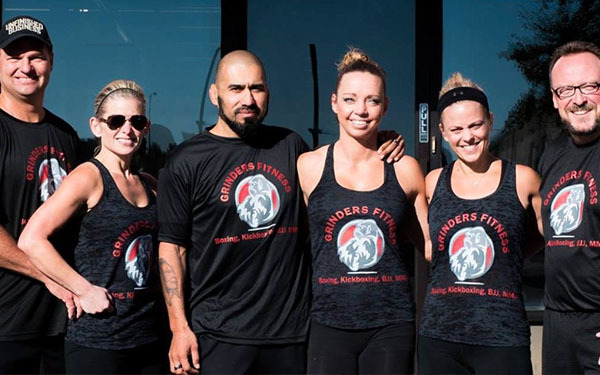 Along with their husbands, Jessica and Naomi approached head trainer/coach Albert Rosales and his partner/fighter/trainer Shannon Sinn about opening a new gym together. The equipments was purchased, the new location secured and all the trainers from Title were hired. The new gym was born. 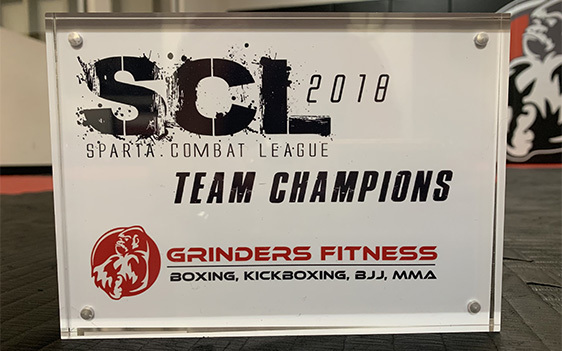 We knew our gym would offer cardio boxing and kickboxing, as well as Brazilian jiu jitsu and MMA training. 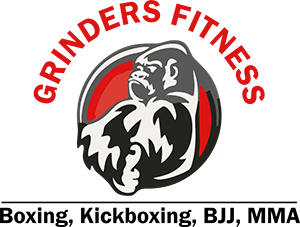 Taking inspiration from Albert and Shannon’s existing fight team, Grinders Submission Fighting, our new gym would be called Grinders Fitness. Albert is the lead trainer at Grinders Fitness. 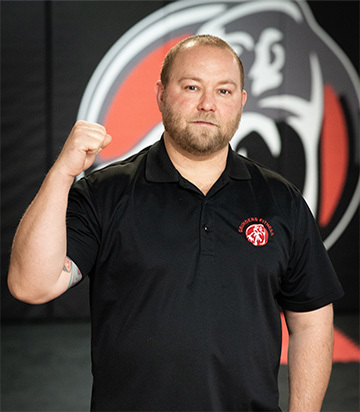 He teaches fitness boxing and kickboxing classes, as well as BJJ, MMA and striking technique classes. 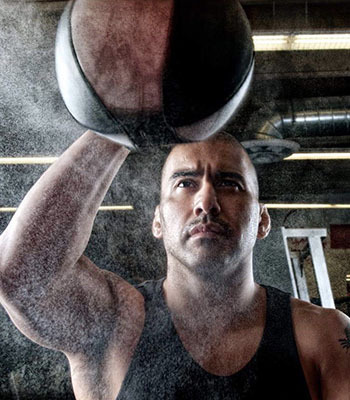 Albert brings over 15 years of combat sports experience to the gym. He is a brown belt in Brazilian Jiu Jitsu. He has been coaching MMA and boxing for 11 years. Albert’s classes are an intense workout but also provide detailed instruction for proper technique. If you are looking for a coach who will push you to the next level in your cardio fitness, Albert is the trainer for you. Shannon Sinn has been a competitive athlete all of her life. 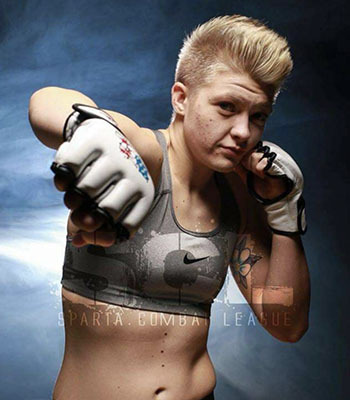 She is a professional fighter currently signed by Legacy Fighting Alliance and fought for the fly weight world title in 2018. She fights because she loves to challenge herself both physically and mentally. She enjoys challenging workouts along with helping others to push themselves beyond their comfort zones. Shannon’s classes are for people at any level who not only want to get a great workout, but also want to see what they are actually capable of doing. Shannon is motivated both by the fear of regret and never being satisfied with her performance. She is always seeking new ways to push herself and her conditioning! She brings the same drive and intensity to her classes and personal training sessions. Shannon is the perfect example of a GRINDER with a NO QUIT mentality. Tayler joined Title Boxing after graduating high school and started taking cardio boxing and kickboxing classes to lose weight and get in shape. She quickly lost about 30 pounds from classes and changing her diet. Once she found out that their was a fight team, she tried it out. After her first night of arm bars from Shannon Sinn, Tayler was addicted. She joined the fight team and trained to step into the cage and fight. Three years later, Tayler is still part of the fight team and has joined Grinders Fitness as a trainer. Kurtis’s love affair with MMA started in 4th grade. The work ethic and dedication that it required have inspired him throughout his life, and is a focus of his classes. It’s all about staying on the grind! 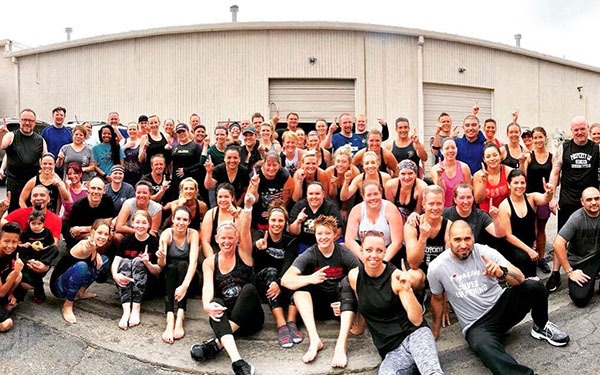 What makes the Grinders gym special and unique to Kurtis is creating relationships and watching each other come together, pushing to make one another better, and the common bond of loving what we do. Angela is just an everyday person who loves training at Grinders. She’s been with the Grinders family since 2013 as a member and trainer. Her classes are focused on core strength, packed with variety, and incorporate foundational yoga elements. 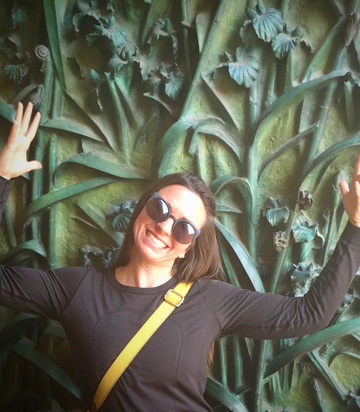 Angela is a yogi with a 200 hour YTT certification and also serves as an educator in Adams 12. Her passion for sustainable health and fitness is coupled with a realistic approach to living a balanced life that includes the outdoors, strong coffee, snacks, friends, family, intentional rest, and lots of time with her husband and hot mess of a chocolate lab. Feel free to ask Angela about her tips and tricks to eat well, sleep well, and stay on track through the ups and downs of life.